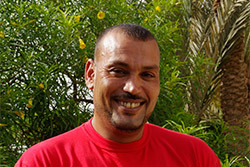 Salahedin Sobhi, originally from Mansoura in Egypt, began his career in the diving industry when he moved to Dahab in 1998. Today Salah is one of the world’s premier technical diving gas blenders, blending for industry greats Tom Steiner, Pascal Bernabé and since its inception, Team Blue Immersion. Also a dedicated father and avid wrestling fan, Salah is an integral part of the diving operation in Dahab. Other than being an Advanced Trimix Gas Blender charged with his panel boards and beloved Haskel booster, Salah is also a certified Apeks service technician and PADI Rescue Diver. When asked his life motto he simply replied “never give up!”.